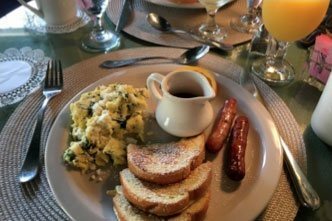 St Augustine Bed and Breakfasts are located just steps away from famous restaurants. 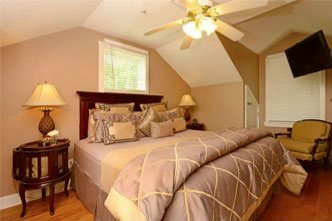 St. Augustine is known for many things starting with its history of course, its beautiful beaches, attractions, charming cobblestone streets, and quaint little bed and breakfasts on every corner of the historic district. We definitely have what it takes to be listed as one of the top tourist destinations in the USA! One other thing many look forward to when planning a visit is our fabulous restaurants. 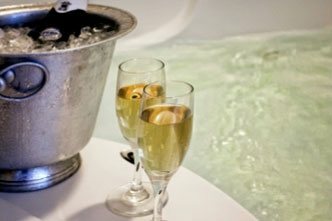 If you are staying with us at the Agustin, you are in luck! Most of these you will find just steps away from our front door! One that stands out in particular and remains one of the most popular choices among our visitors is the Columbia. Chances are if you are from the Tampa, Fl area or you are a regular St. Augustine vacationer, you've been there. Regardless of which or if you've never been to either of those cities, we are here to point out some of the main things about this Spanish eatery! What brought us to this article was the fact that this restaurant is celebrating its 30th year here in 2013 and its 108th year in existence! Columbia Ybor City is actually Florida’s oldest restaurant. The original Columbia Restaurant was founded in Tampa’s historic Ybor City in 1905 by Cuban immigrant Casimiro Hernandez, Sr. Additional Columbia locations include St. Armands Circle in Sarasota, Sand Key on Clearwater Beach, Central Florida’s town of Celebration, the Columbia Café at Tampa Bay History Center on the Tampa Riverwalk and the Columbia Restaurant Café at Tampa International Airport. All of these locations are owned and operated solely by 4th and 5th generation members of the founding family except for Columbia Restaurant Café at the Tampa Airport, which is operated in partnership with HMSHost. Many visitors already opposed to chains when they get here ask what makes this St Augustine location stand out from the rest. Our answer is – Location, Location, Location… Situated right in the heart of the historic district at the corner of St. George Street’s pedestrian mall and Hypolita Street, this place can’t be beat when you are in the mood for good wine and some fantastic Paella de Pollo Valenciana! The atmosphere is in perfect sync with its surroundings and one can really get this feel when dining in their amazing courtyard! The building is simply charming inside and out, and makes the perfect venue for special occasions, events, large parties, or any romantic occasion! The Columbia has become famous over the years for their special menu items; in fact, the restaurant’s Original 1905 Salad helped list them in USA Today as “One of the 10 Great Places to Make a Meal out of a Salad”! If you've never been here, put this on your dining itinerary for your next stay with us. 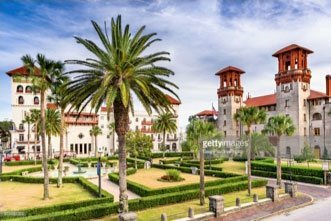 They are literally just steps away and you may find yourself returning time and time again making the Columbia a traditional St Augustine stop. The Columbia Restaurant is open seven days a week and serves lunch and dinner daily. Reservations are accepted and may be necessary during the holidays and busy weekends! Note each year on its anniversary, the restaurant celebrates 1905 day and their prices actually set back to what they were this very year! This takes place in the month of September.